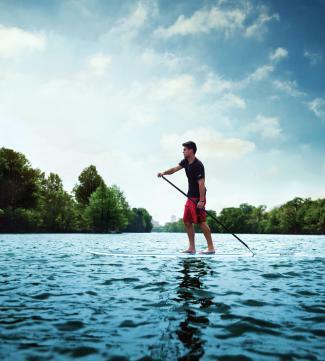 From kayaking to stand-up paddle boarding, wake surfing to leisurely canoe-paddling - Austin offers an abundance of watersport activities. And with 300 days of sunshine and an average temperature of 68 degrees, being in the water comes naturally in Austin, Texas. A trip to Austin wouldn&apos;t be complete without visiting the Lady Bird Lake Hike and Bike Trail. Located in the heart of the city, this 10-mile off-road trail is Austin&apos;s crown jewel. While there, you can kayak, canoe or try your luck at stand-up paddle boarding from various spots along the trail. Wakeboarding and wakesurfing continue their reign as two of the most popular sports on the water. With several boat-friendly lakes and cable parks in the Austin area, wake surfers around the world consider Austin as an epicenter of the sport. At Texas Ski Ranch, first time riders can take advantage of private lessons and beginner cables, or lounge on the nearby beach and watch up-and-coming amateurs try out new tricks. Try your hand at surfing at North America&apos;s first inland surf park. NLand Surf Park, which opened in Fall 2016, includes a full lagoon with 11 surfing areas featuring 1- to 6-foot waves. This sustainable surfing destination is unmatched in wave consistency as well as fun for all ages and experience levels. Whether you want a relaxed tour of the lake or are seeking to catch some serious air, there&apos;s a sweet spot for every wakeboarder and surfer in Austin.